Home / Tips and Info / Everyday Life / Why doesn’t it FEEL like the holidays are here? Why doesn’t it FEEL like the holidays are here? It is almost Thanksgiving. The turkeys are thawing in the refrigerator. The shopping lists for Thanksgiving dinner are prepared. The date and time of our family Christmas get-together is set. The names are drawn for the gift exchange. So… Why doesn’t it feel like the holidays are upon us? And what do I do to change that? When I get into one of these funks, it is hard for me to be creative. I can do the work. I can do all the right things, and they can come out looking good. But they are missing something. That spark is not there. Again, what do I do to change that? For me, the best thing I can do is get out of my routine and do something appropriate. So that is what I did. I took the time (when I didn’t feel like I had the time) and made the drive to a somewhat local, one location, garden center that happens to ship its plants all over a several state radius, Corso’s Garden Center. 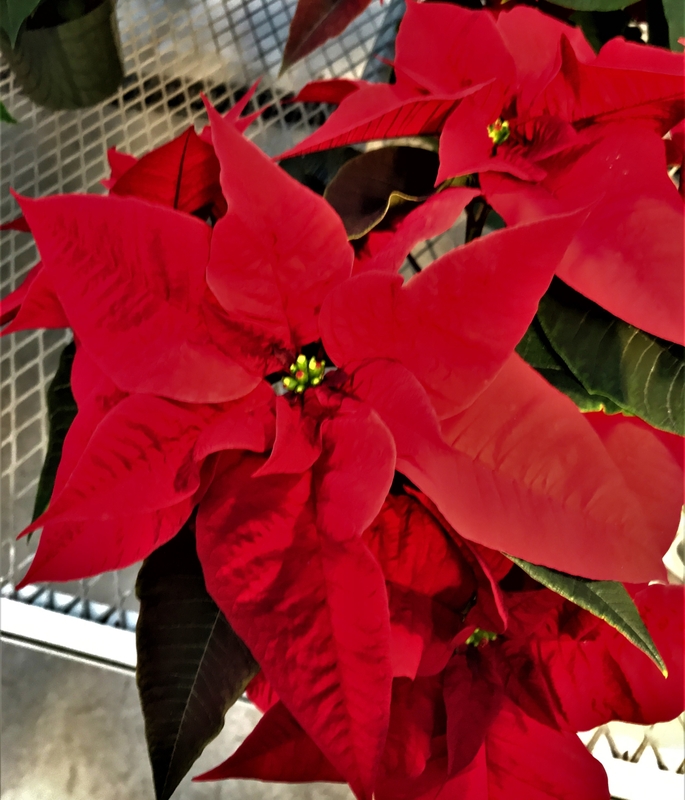 I called them first to ask if the poinsettias were in the store’s greenhouse and if they were in bloom. The answer was “Oh, yes!” And as you can tell from the above photo, boy were they! Not only that, but the beautiful decorations were up, included an exquisite garden railway, set up by a local garden railway enthusiasts club. I am sure soon the music will be playing as well. It struck me later that we don’t have much of that in our area anymore. The higher end department stores and malls used to be beautifully decorated, and abuzz with music and people. Most of those high end stores have closed in our area, and the malls are feeling the loss. I was missing something I hadn’t even noticed was gone. I knew the stores weren’t there anymore, but I hadn’t realized that the “extras” had left too. What has replaced those extras is all mass produced and artificial. And we have already been looking at it for months. I am so glad that there is somewhere I can visit that still goes over the top for Christmas, with natural beauty and the scents of Christmas included. Not the artificial scent of cinnamon pine cones found EVERYWHERE (and I should know, as I have a coughing fit every time I get near them), but the real scents of flowers and pine in abundance. I am happy to say the inspiration is back! Full force! And now I know where to go when I need it again! Where do you go to get re-inspired? Previous post: Eat Your Frog! Next post: The Store is Open!